Western Morning News - 24 November, 1937. Garrick Theatre, London. 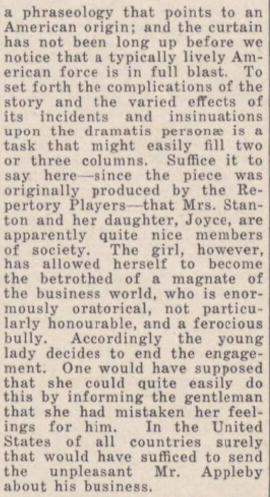 "Miss Joan Marion plays the young girl with quiet skill and a great deal of charm. It is most agreeable to watch her score her points off the banker and her other admirers. Mr Charles Mortimer raves splendidly as the unwanted banker and the rest of the cast enter in to the fun with gusto." 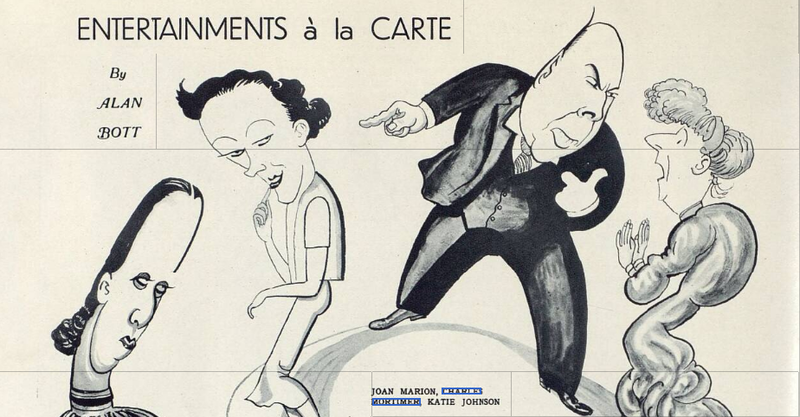 The Stage 11 November, 1937. The Garrick, London. 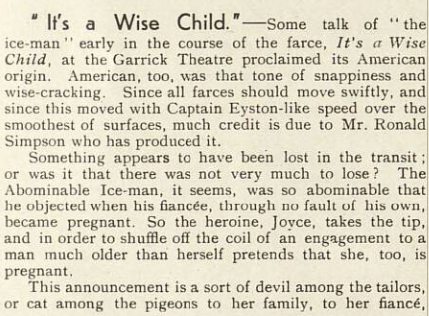 The play will be produced by Ronald Simpson, with Ellen Pollock, Ivor Barnard, Wallace Douglas, Joan Marion, Charles Mortimer, Joan Hickson and Edward Harben." 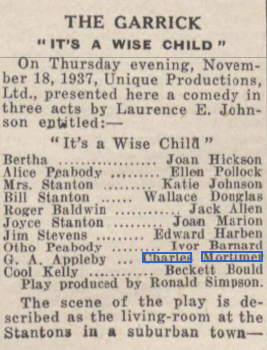 Charles Mortimer played GA Appleby in "It's a Wise Child", at the Garrick Theatre, London, from 18 November to 11 December, 1937. 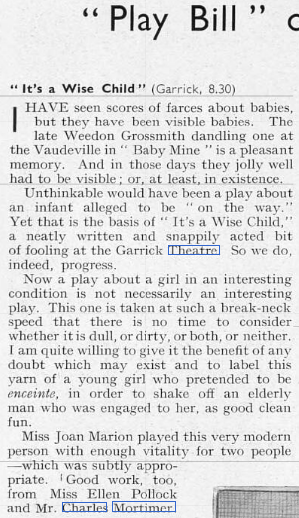 Article from the Western Morning News and Daily Gazette, on 24 November, 1937. This eager American farce is confidently written, ably produced, and vigorously played. Its theme (a comic dissertation on the propogation of the species) is typical of its kind rather than calculated to charm serious students of the drama or those whom farcical assault and battery leave unscathed. 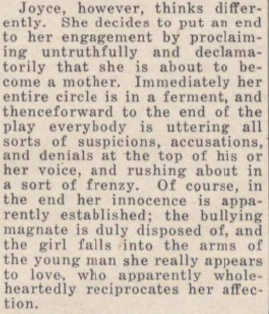 Its small-town characters-thrown into convulsions, first by the news that "Annie is about to become a mother", and then by horrid speculation concerning the identity of the concealed father - keep those English actors at shouting pitch and the audience in fits of laughter. The fun is rough, but ready; and although it is machine-made it has a compensatory slickness. The undertow of sentiment, coming to the surface at last, gives Miss Joan Marion and Mr Edward Harben softer instruments than sounding brass to play, and they play them well. 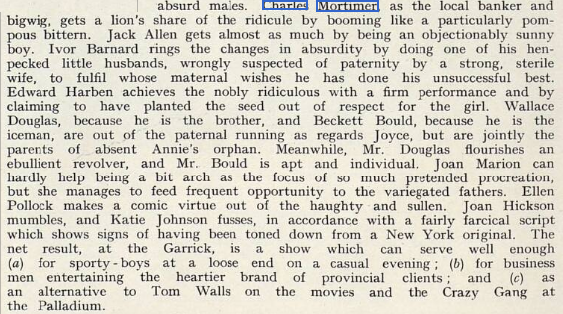 Lively fits of cunnubiality are thrown by Miss Ellen Pollock, Mr Ivor Barnard, and Mr Beckett Bould. Mr Charles Mortimer effectively out-hectors Hector, and Miss Katie Johnson mothers it gamely as a distraught Andromache. Thus a gruelling engagement is won by general devotion to farcical duty rather than by individual feats of virtuosity. 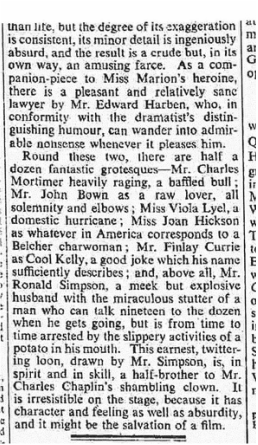 From the Yorkshire Post on 19 November, 1937.